Turnabout Storm is a six-episode, eight-and-a-half-hour fan-made video series crossing over the Ace Attorney video game series with Friendship Is Magic, which tells you most of its major problems from the start. The first of those is its length, barely an hour shorter than an entire twenty-six episode season of the show, while telling a story only barely more complex than a typical two-parter. Part of that is a testament to the efficiency of the show, of course–the writers are able to convey surprisingly complex story structures such as “The Cutie Mark Chronicles” or “Princess Twilight Sparkle” in very short running times and in ways still simple enough for the extremely young primary target audience to follow. Turnabout Storm lacks that efficiency, and at times (particularly in episode two) can become something of a slog. The more interesting problem, and the one the series itself seeks to tackle, is the simple incompatibility of the two series. For all that both are heavy on puns, meaningful names, friendship, and a generally positive, sincere outlook on life, Friendship Is Magic is a utopian show that depicts a society of peace and order that is only ever interrupted by external threats, while the Ace Attorney series is set in a world where murder is so common a defense attorney can spend his entire career on nothing else, criminal trials are massively unfairly biased in favor of the prosecution, and said prosecution is so corrupt that, in his first three years as an attorney alone, main character Phoenix Wright uncovers murders by two prosecutors and the chief of police, not to mention instances of blackmail, evidence tampering, and the creation of fraudulent evidence. The two worldviews fundamentally cannot coexist, and from the moment the series begins, this tension works to undermine and corrupt Equestria, the setting for almost all of the crossover. Despite that setting, as well as a cast in which only two Ace Attorney characters have large roles (though a third has a small but very significant part), it is the worldview of Ace Attorney that seems to win out for most of the series. 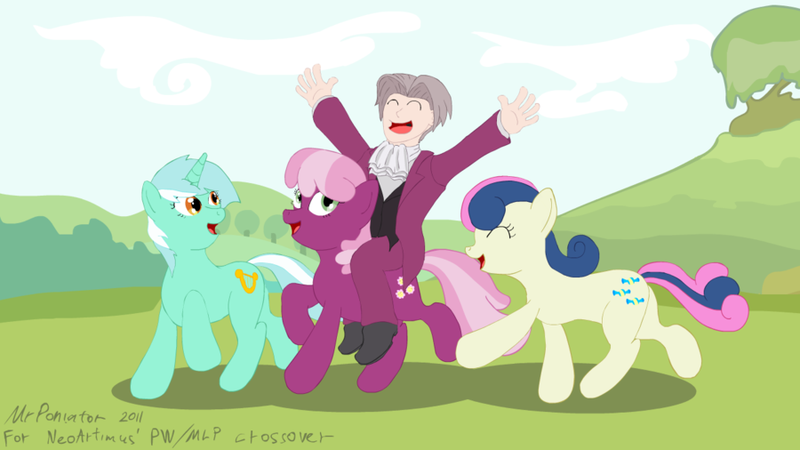 This is perhaps inevitable as a result of the choice by the creators to impose the Ace Attorney structure on Equestria. For those unfamiliar with the games, the Ace Attorney series has a fairly rigid structure for each case: a brief (and usually misleading) scene shows a significant event related to the case (usually a murder, but sometimes another event related to the motive for the murder), then has an “Investigation” sequence in which main character Phoenix Wright (or, in some cases, another lawyer) enters the mystery’s setting, encounters some of the major players in it, and is hired to defend someone falsely accused of murder (with, as of the series’ fourth installment, one case that does not initially involve murder and one where the client is guilty). The next morning the first trial sequence begins, during which the prosecution plays ridiculous games like concealing evidence until the most dramatic moment or trying to trick the defense into a rhetorical trap, while the player character (again, usually Phoenix )interrogates witnesses and tries to get them to contradict themselves or the physical evidence. Eventually, he exposes a whole in the prosecution’s theory of how the murder occurred or casts suspicion on a suspect other than his client, and the trial is suspended for a day, leading to another Investigation sequence that afternoon. The next morning the trial resumes, and this second day of court is usually where the really ridiculous courtroom shenanigans occur: the most eccentric witnesses, such as parrots, puppets, or ghosts, the absurd bluffs Phoenix throws up in an attempt to stretch out the trial until he can figure out the real killer, and usually (some cases, especially early in the series, stretch into a third cycle of investigation and trial) dismantling one of the witnesses’ stories and getting them to confess to the crime. Turnabout Storm follows this structure to T. One might argue that this represents a narrative collapse from the Equestrian point of view, but not quite–there is no threat to the continued ability to tell stories, but rather the imposition of a new way of telling stories and a new genre of stories to tell. It is the imposition of a new narrative, but the old continues underneath. The essential tension between the generally sugary world of Friendship Is Magic and the brutal fact of murder necessitated by the imposition of the Ace Attorney structure is constantly highlighted throughout the story. Most obviously, the contradiction created by the crossover is used to create a diegetic justification crossover: no attorney or judge in Equestria is willing to take on a murder case, so Phoenix Wright and the nameless Ace Attorney judge are summoned magically from their world. This tension also manifests in the conflict between Phoenix and Twilight Sparkle that defines Part Three of the series (which is actually the third and fourth episodes, one following each character). Phoenix has more than once ended the first day of trial by casting suspicion on someone he believes is innocent, as a delaying tactic to give him time to gather more evidence and find the real guilty party. He is forced to do this at the climax of the second episode, leading to the arrest of Fluttershy. Twilight Sparkle reacts to this as a complete outrage–she hired Phoenix to clear one of her friends, and now two are being tried for murder–and so she and Phoenix separate for the second investigation phase, allowing for the inclusion of more characters (Phoenix teams up with Pinkie Pie, which is delightful, and Twilight with Apple Bloom, which is all right) and a great deal more evidence-gathering and interaction, important since in addition to the (relatively complex) murder mystery itself there are also the ongoing story threads of why Phoenix in particular was summoned and why Trixie (who is serving as prosecutor) is so determined to destroy Twilight and her friends. That last becomes important in the final two episodes, after Twilight and Phoenix reconcile and begin cooperating again. The two apparently incompatible structures of the murder mystery and the friendship lesson begin to merge as Sonata–who is clearly framed from fairly early on as the killer–takes the stand and begins bullying her former classmate Trixie, forcing Phoenix, Twilight, and Trixie to work together to take her down and heavily hinting at Trixie’s reasons for hating Twilight so much. This could fit in either world–it is particularly likely to occur in Ace Attorney where Edgeworth is involved–but the twist that follows makes it clear that the two structures are merging. After Sonata finally confesses her guilt, Phoenix recognizes that there is still a contradiction in her testimony. He considers whether to simply accept his victory, but chooses instead to object, because an established and oft-repeated theme of the Ace Attorney games is that uncovering the truth is more important than winning the trial–that a correct verdict is better than a favorable one. In the case where Phoenix’s client is actually guilty, for example, the player has the option at the end to clinch the verdict of not guilty, or expose the client; the one that leads to a happy ending (which is treated as having happened by later games in the series) is the one where he gets his own client found guilty. Here the inverse occurs; Phoenix’s client is innocent, and he can either let Sonata go to jail for the murder everyone–including Sonata herself–believes she committed in self-defense, or he can pull on the one thread still dangling. He of course chooses the latter, which is consistent with how the Ace Attorney universe works, and what he discovers partially restores the Friendship Is Magic universe to innocence: there was no murder. There was an attempted murder of one pony by another, of course, which is still worse than anything we’ve ever seen ponies do to one another in the show–as of this writing, the most evil act by one pony against another (assuming that Nightmare Moon blotting out the sun would not cause massive ecological devestation because Magic) is a toss-up between the callous greed of the Flim-Flam brothers in “The Super Speedy Cider Squeezy 6000” and Silver Spoon and Diamond Tiara picking on Scootaloo for her disability in “Flight to the Finish.” But there was no actual murder, just a terrible accident that happened to the very pony trying to commit murder; Sonata is guilty of blackmail, but not murder, even in self-defense. Equestria restored, Phoenix must return to his own world before his presence (and the Ace Attorney rules he brings with him) can cause another murder. 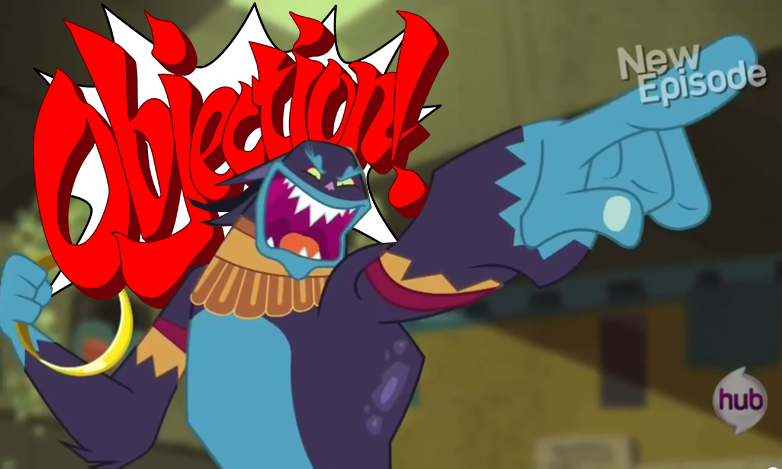 The ending is long, happy, and silly, including both the traditional “everyone shouts Objection!” formula from Ace Attorney and the Friendship Is Magic letter to Princess Celestia. There are still questions left unanswered–most prominently, exactly what happened to Trixie to make her so bitter, and what exactly Rainbow Dash was doing in the pictures Sonata and Ace Swift planned to blackmail her with–but we get enough information to form our own theories, and more importantly we know enough to understand why the characters react the way they do. And maybe having some mysteries left is a good thing. After all, both Ace Attorney and Friendship Is Magic continue on, restored to their own original structures, but both with hints of how this collision will affect their now-separate futures; Trixie has softened slightly, Rainbow Dash has joined the community of professional racers, and Phoenix has the magician’s hat he wanted as a kid, which looks suspiciously like the one his adopted daughter Trucy will have in the fourth game. The two seemingly incompatible worlds have influenced one another for the better–a concept which fits well into the themes of both series. OK Froborr. How could you see this story as “slightly more complex than the average two parter”? Turnabout Storm plot-wise is a mystery story, not an invasion, not an adventure, it's a mystery. The complexity of the mystery is what makes it entertaining. If you were to just find out all this information in the easiest possible way you could possibly cram it into 44 minutes… But it would be a kind of unsatisfying mystery and in the end it would mean the Ace Attorney elements would dominate the story MORE because their wouldn't be time to use the FiM cast fully. There are lots of points where the pacing drags, but I could hardly see this story really working at anything less than a 90 minute length without shooting the pacing to hell. RavenRegios has turned the story into a “novelization” available at FimFiction. (http://www.fimfiction.net/story/6177/phoenix-wright-turnabout-storm) It fills in some of the holes; I particularly like the description of Phoenix' morning routine on the second day of the trial. Perhaps the biggest addition is the playing up of the romance angle between Phoenix and Twilight. I don't think it's actually all that complex, but I'm not counting every courtroom reversal and investigation conversation as part of the story–a lot of it is padding or unnecessary character schtick (Cruise Control is particularly grating in that regard). I'm not saying this should be 44 minutes–the rigid structure of alternating investigations and trial scenes and the presence of the prosecution trying to interfere virtually guarantees it will take longer than a detective story with similar cases–but rather that it is extremely slow. And 90 minutes is MUCH closer to 44 than to 500. Perhaps the biggest addition is the playing up of the romance angle between Phoenix and Twilight. Eww. Thank you for warning me away from it, there is a very small but nonzero chance I might have read it otherwise. About the length, I think a fondness for the structure of the Phoenix Wright games is in play. A single case, perhaps in the middle or towards the end of any particular game, takes quite a while to play – especially on the first playthrough. At Everfree Northwest, I saw someone working on a playable case conversion of Turnabout Storm – a heck of a project, but one I would play the heck out of given the chance. But for a video? I can see someone making an “abridged” version of the whole case and seeing a great deal of traffic for it. It'd make an interesting project if it could be done.